A recent news story by our local CBS affiliate, featuring my veterinary classmate Dr. Garett Pachtinger, told the tragic story of an owner who came home to find her dog with her head stuck in an empty bag of potato chips. 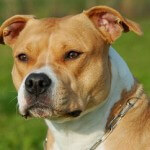 Sadly, Lucy, a pitbull mix, had suffocated and could not be revived. While a story like this is unimaginably sad, and may seem like a rare isolated incident, those of us in the veterinary community hear stories similar to Lucy’s on a regular basis. There are some ways to “doggy-proof” your home, however, to minimize risks to your pet. 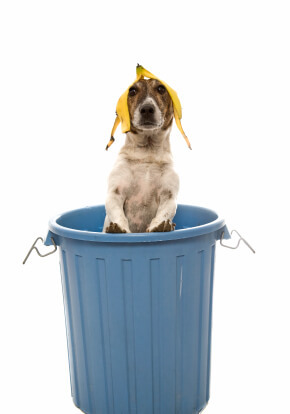 Many dogs have a penchant for eating trash, and dumpster diving can pose a variety of safety hazards to Fido. First, spoiled food can contain a toxic mold known as mycotoxin, which causes tremors, seizures and hyperthermia. Dogs displaying these symptoms need urgent emergency care. Second, ingestion of leftover (but not moldy food) can cause gastroenteritis and sometimes pancreatitis. Third, as we learned from Lucy’s tragic case, dogs can suffocate in empty chip and cereal bags. Fourth, if a dog ingests bones or other large objects from the trash, a gastrointestinal obstruction may result. 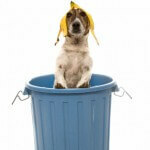 So how do we prevent Fido from dumpster diving? Buy indoor and outdoor trash cans with lids that can be securely clamped shut. Put trash in a room where Fido cannot access it. Some of my clients have had success with an indoor electric fence, that can be used to train Fido to stay out of the kitchen. Use scissors to cut off the closed end of any chip, cereal or other plastic bag that is to be thrown away. Sadly, I have heard several stories about clients’ dogs drowning in their own backyard pools. While many dogs love to swim, and swimming can be a great source of exercise, pools can present dangers to dogs just as they do to young children. Dogs should never be allowed to swim unattended, without adult supervision. Doors and gates leading to the pool area should be kept locked at all times, and should only be openable by adults. Pools ideally should be completely fenced, to prevent dogs, neighbors’ children and wildlife from diving in. This applies to both cats and dogs. 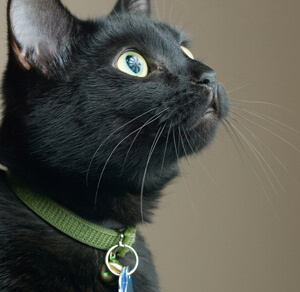 Some owners of indoor cats prefer to keep a collar on Fluffy; if Fluffy were to escape, then she would have identification tags and her owners could be located. However, I’m aware of a few indoor cats who were strangled when their collar caught on something in the home. I’m also aware of a kitten whose paw and leg got stuck under her collar for several hours; the leg could not be saved and an amputation was needed. 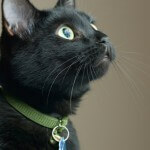 We do not recommend collars for indoor cats, but strongly support microchip implantation in all our clients’ pets. Microchips, the size of a grain of rice, are implanted under the skin and provide permanent, lifelong identification for our pets. 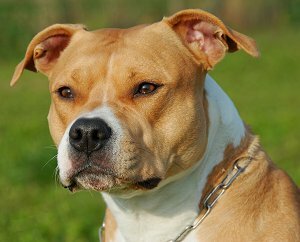 I also recommend that clients remove Fido’s collar before he is put in his crate; dogs should never be crated with collars or leashes on, since this poses a strangulation hazard. Finally, I never recommend tethering a dog to the deck or to a tree via their leash. Dogs staked out in the yard are vulnerable to any neighborhood predators (think about rabid raccoons!) I know of a tragic case where a dog hung itself off the side of the deck where it was tethered, unattended. 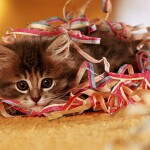 Kittens and puppies like to chew on anything they come across, including electrical and cable cords. I have seen several kittens and cats come in over the years with severe oral burns from chewing on electrical cords. If animals chew on a cord and receive an electric shock, they can develop something known as noncardiogenic pulmonary edema, which is a life-threatening accumulation of fluid within the lungs. The best way to prevent this from happening is to keep puppies and destructive dogs crated at all times, unless they are under direct supervision. Cords should be tucked away, out of view, as much as possible. Cord keeper products can be purchased; these contain cords and cables in one tube, while also providing a protective cover. Keep doors closed to rooms where Fluffy or Fido has been known do to some damage. 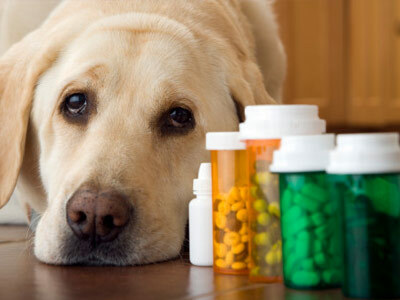 Accidental medication ingestion is one of the most common reason dogs (and sometimes cats) are brought to our veterinary hospital. I’ve seen dogs eat pain medication, ADHD medication, vitamins and supplements of every kind, asthma medication, anxiety medication, diaper and psoriasis creme as well as illegal drugs of various sorts (which always seem to belong to the “workman” or “painter” who happened to be in the house that week.) Any of these ingestions can potentially be toxic to our household pets, so prompt intervention is needed; call your veterinarian right away.Dogs can eat through most types of plastic pill bottles, as can some cats. Both human and veterinary medicines should be kept safely locked in a cabinet or closet at all times, out of the reach of our canine and feline friends. This is really another post in and of itself, and will be someday, but certainly warrants a mention on this list. Grapes, raisins, chocolate, garlic and onions can all be toxic to cats and dogs. To avoid accidental ingestion of these foods, keep pets from having access to the kitchen, especially when foods are out on the counter. Again, an indoor invisible fence may be a worthwhile investment for those dogs who like to counter surf (or for the one dog who comes to my practice that learned to drag a dining room chair over to the fridge, to help open it and raid the contents. True story!) Lock pantry and fridge doors if Fido is wily enough to open them. Lock trash cans as well (see item #1 on this list). Kitty cats, this item particularly concerns you! 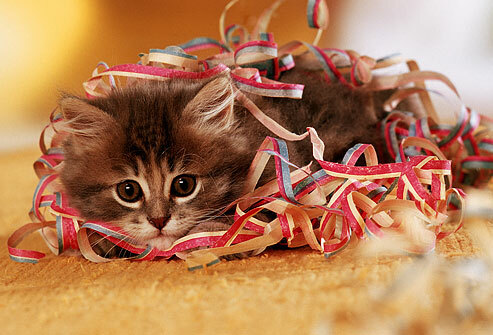 Cats often have a taste for linear objects such as string, thread, ribbon, dental floss and hair ties. These items, if ingested, can cause a very dangerous problem known as a linear foreign body.One end of the linear object can become lodged in the stomach or proximal small intestine and the other end continues to travel through the intestines. The material becomes tightly stretched and the intestine can then “accordion up” on itself. The linear foreign body can eventually saw through the plicated intestines. Pantyhose is a common linear foreign body in dogs. The simplest way to prevent this type of ingestion is to prevent Fluffy from playing with any strings, threads or hair ties. Be mindful of picking up these types of objects when you see them in the house, and keep Kitty from pulling them out of the trash can. 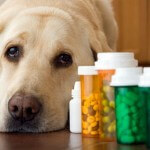 It seems that some people are unaware that rat poisons are also highly toxic to cats and dogs. If a product can poison and kill a rat, it can also poison Fluffy or Fido. The most common type of rat poison used today contains either fumarin or warfarin; these act as anti-coagulants, and cause the rat to bleed to death. The same thing can happy to Fido if he ingests the poison. Fortunately, there is a very effective anecdote (Vitamin K) to this type of rat poison. However, the problem needs to be diagnosed and treated early for a good prognosis. If you have any question whatsoever about whether your pet ingested rat poison, bring them to your veterinarian immediately. This is a very treatable problem if caught early! There are other types of rat poisons on the market, which can cause neurologic symptoms, or mineralization of the body tissues through hypercalcemia. The bottom line is that if you have pets (or small children), rat poison should not be in your home. Ask your exterminator for alternative solutions, such as traps. While there are some alarming stories in this post, it is my hope that we can all learn from other pet owners’ tragedies and do what we can to keep our pets safe at home.